Dear Chris, I admire his ability to make buildings and landscapes at 1/72 scale. For me it is much more difficult than painting figures, since it is necessary to have a lot of imagination. Much encouragement with this gigantic diorama. Hi Paul. The Post image links here are all down. Is it possible please to re instate them or do I need to re post? Just a quick thank you to Paul for very kindly reinstating the links that were broken with the Postimage saga. Hopefully they will be resuming normal service soon as I have found their site to be a lot more user friendly than the PB crowd. 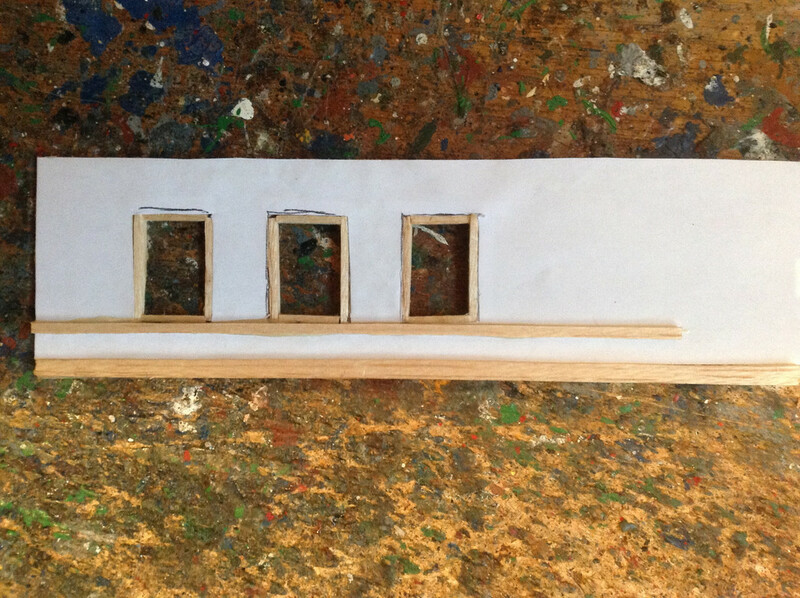 I am currently constructing a 'set' in order to illustrate the French occupation of the Ferme de Gemincourt. 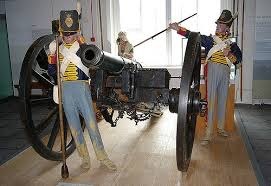 My idea is to have the French infantry kicking in the windows in order to access the main building. After some research by Der Felmarschall and using the premise that this was a bit more of an 'upmarket' property than your average Belgian farm I decided on a light blue wallpaper with white architrave. So ' in season' darling! 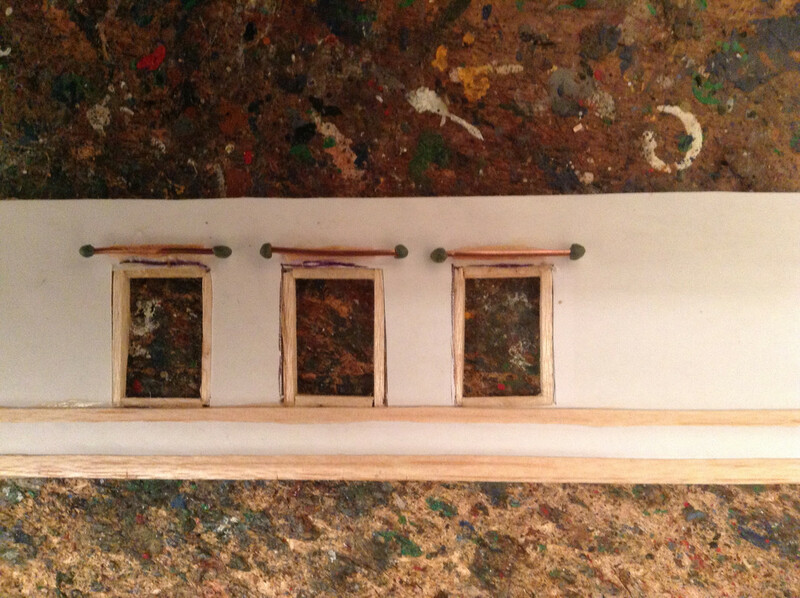 The window poles are copper wire with greenstuff finales. More to do including curtains, floor, glazed windows, tidying up and conversions to fit the scene. I have been decorating based on one of my favourite films, Barry Lyndon. Incidentally the beauty of the pictography is investigated in this link which fellow modellers may find useful. 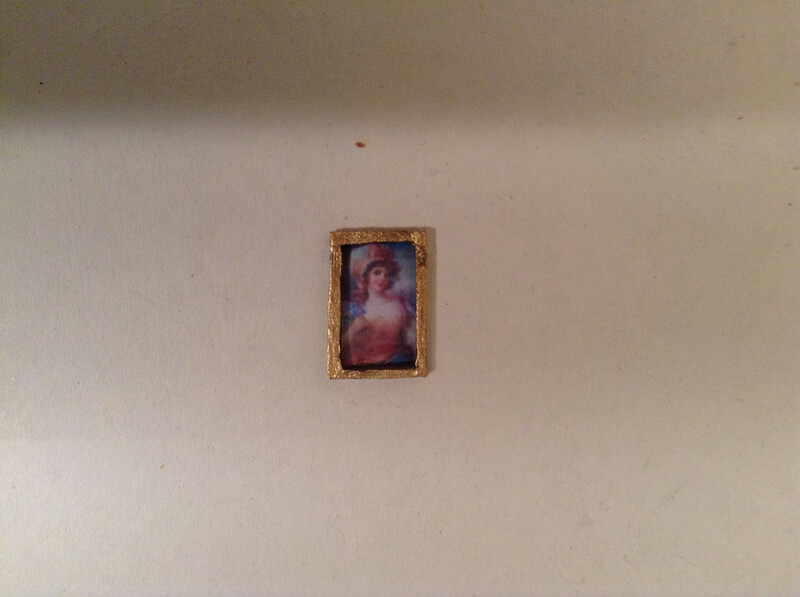 I found some nice portraits from a dolls house site and constructed a family painting. 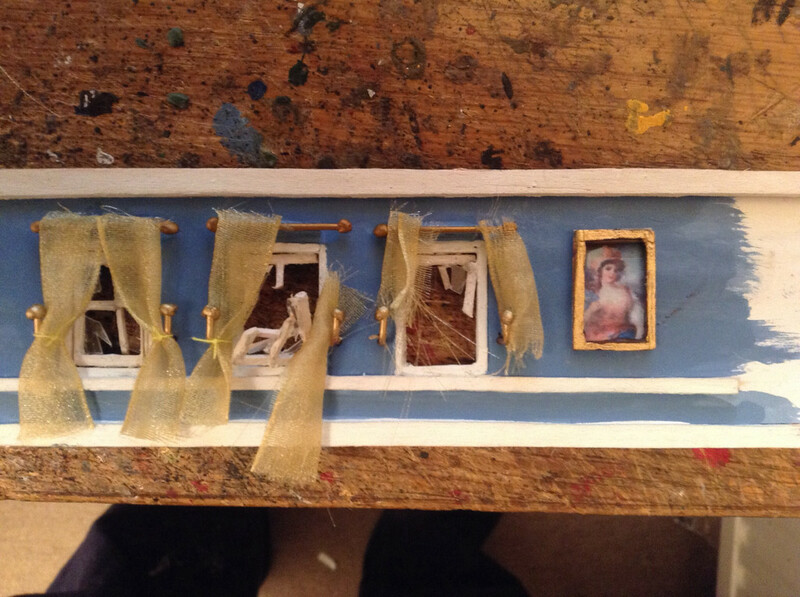 I have added the remains of the sash Windows along with the portrait. The other bits will be on the inside floor. Curtains are from fine ribbon with tie backs and slashed to represent the destruction of the French gaining access. Lots of tidying up yet before I start playing with the camera angles, troops and lighting. May I ask what brand your roofs are? The roofs are from Wills kits. Ratio House, Buckfastleigh, Devon TQ11 0NR but available on the net through good model shops. 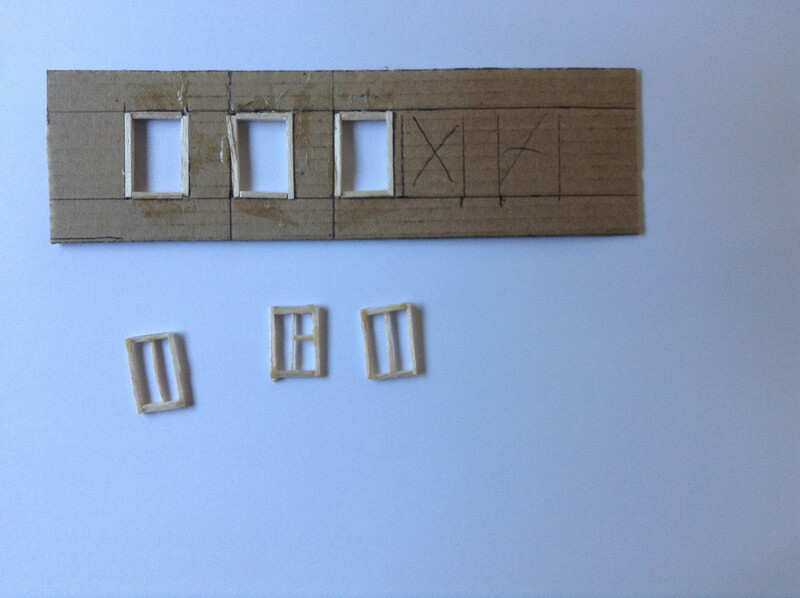 I have used rounded tiles as they are representative of continental roofs. Whilst the Belgian variety has its own look I feel that in the scheme of things they look right. The world of railway modelling is often overlooked but I feel that their quest for modelling perfection in their works provides a source of inspiration. Some of the objects that are available are unbelievable and most useful to our particular hobby. Also U tube has some excellent tutorials regarding construction and groundwork. That is where I met the Chincillas and their dust for instance. Brilliant stuff. I am currently preparing 3PM and my interior will hopefully come alive for it. 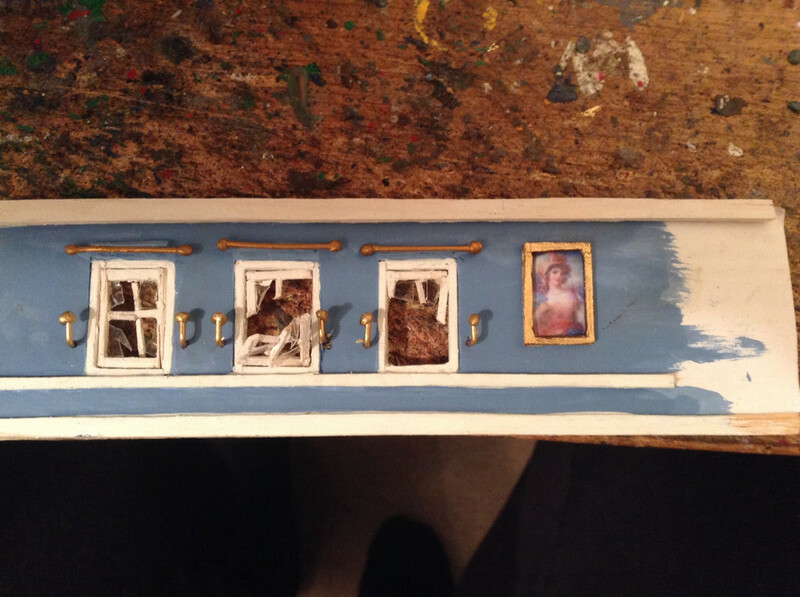 In order to complete the set and get a background effect through the windows, Der Feldmarschalls baking tray made a triumphal return. The set was placed on the sand tray and suitable foliage created the new horizon in line with the model building on the set. As usual great action and very nice conversions! What a dynamic scene! I love the soldier that is climbing through the window. The eleventh Cuirassiers were a little different in the 'one hundred days' campaign in that they were not issued with cuirasses. Whilst I personally feel that the officers and more senior ranks may have had then this leads to modelling problems as every wargame I have seen has them armoured up. I decided that I want as realistic as possible depiction of these fellows and got chopping. The Italieri Dragoons have the pre Bardin coat but when sliced onto Zvevada Cuirassiers and their mounts they seem to look the part. I was going to swap heads but feel that this is not necessary. We shall see. Blanket rolls and epaulettes from Greenstuff help. 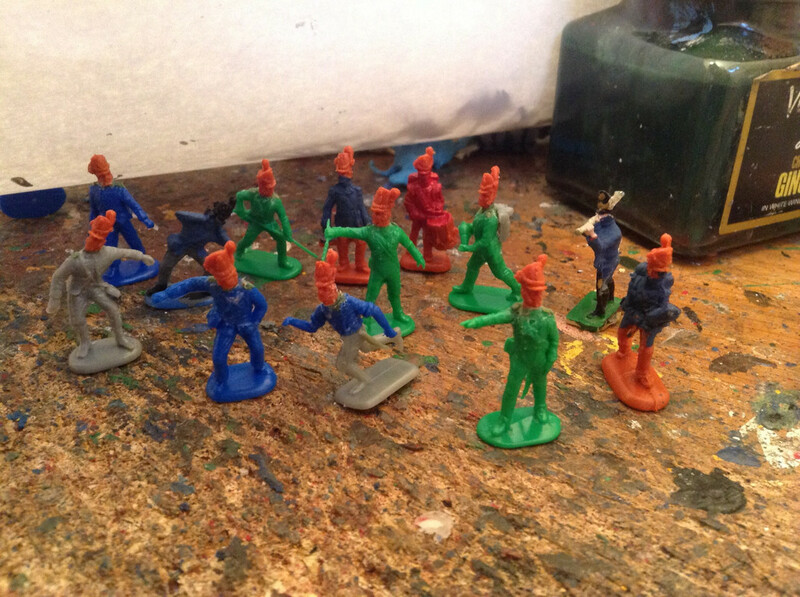 Some tidying up is required but overall I am pleased with the first batch of my twenty five strong unit. Many thanks to Thomas Mischak for finding the picture of these fierce-some chaps that wrought carnage in the original action. 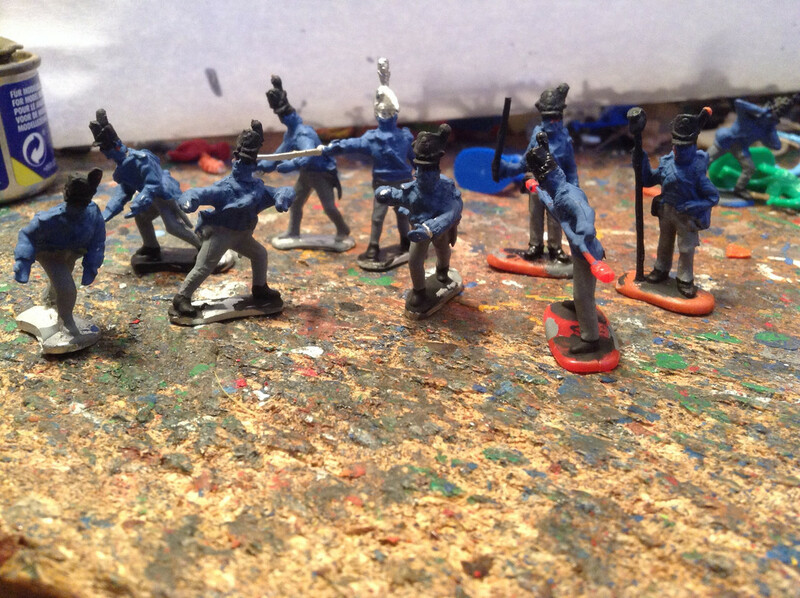 As the British 5th Division under Sir Thomas Picton arrive I wanted something a bit more animated than the usual crews. I have converted the Hagen offering which is very dynamic to the Belgian shako. Also a bit of chopping and Greenstuff has resulted in something a bit more lively than the usual offerings. 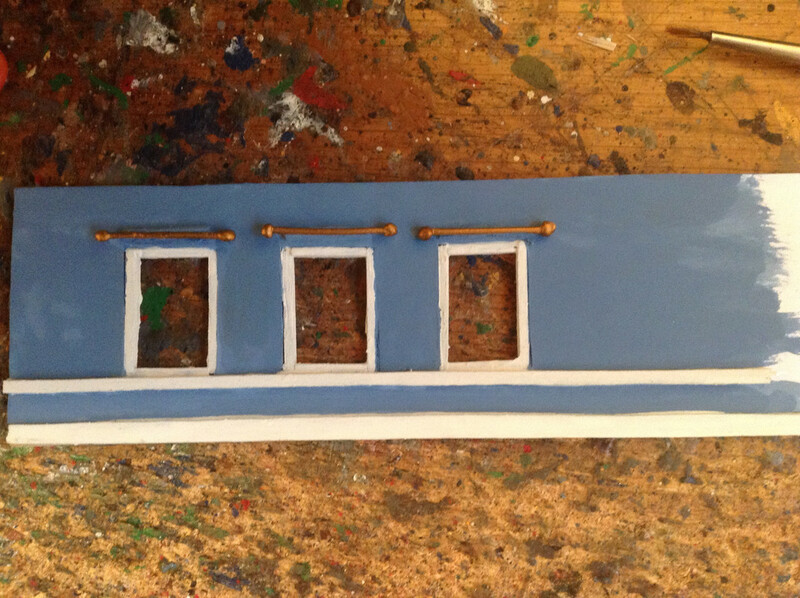 I hope that they paint up into a decent three gun battery for Brevet Major Thomas Rogers to command. Also very interesting and lifelike conversions. I am waiting to see them painted in the epic picture. Having had the privilege to see the masters at work during the Dioramica I was intrigued to see Massimo, Frank Ziegler etc using a magnifying head visor. I did a bit of research and got one for myself. Absolutely brilliant, I can see again. Mine has lighting as a bonus and works with or without normal glasses. This is the one I got but there are lots of choices. I do not normally post pictures of my individual units on the forum because I do not consider my painting skill to be anywhere near the league shown in the gallery. 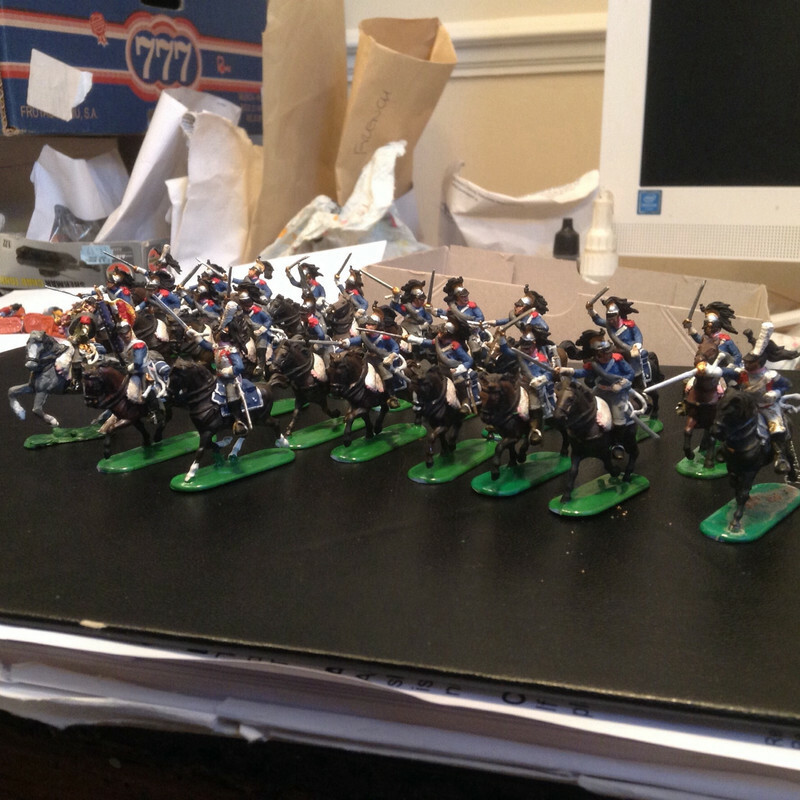 However, I am particularly pleased with my Eleventh Cuirassiers after their severe chopping session. 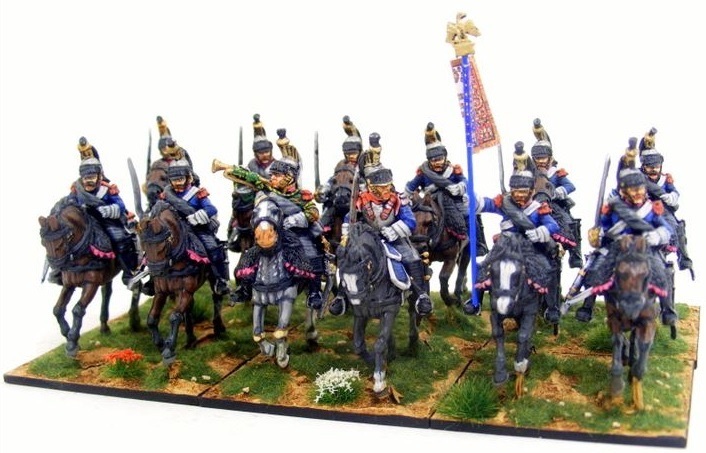 Whilst the original unit, along with most, as I understand it French cavalry units, did not carry a standard, I felt that it added to the look of the thing. I hope the purists will forgive me. Also, my good friend Thomas Mischak sent me an article on the British Army artillery withdrawing from Germany. It had this very nice picture which is great for us modellers. 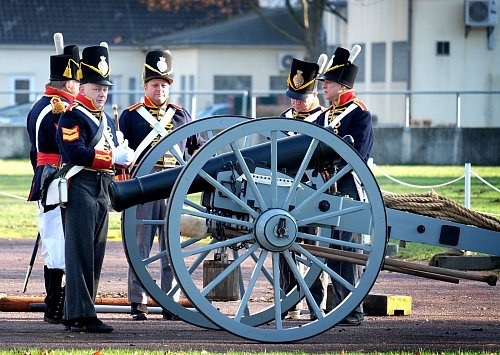 The lace is a yellow as opposed to some of the brass/ white versions I have seen depicted and confirms the Royal Artillery pictures from their museum. Marvellous stuff. 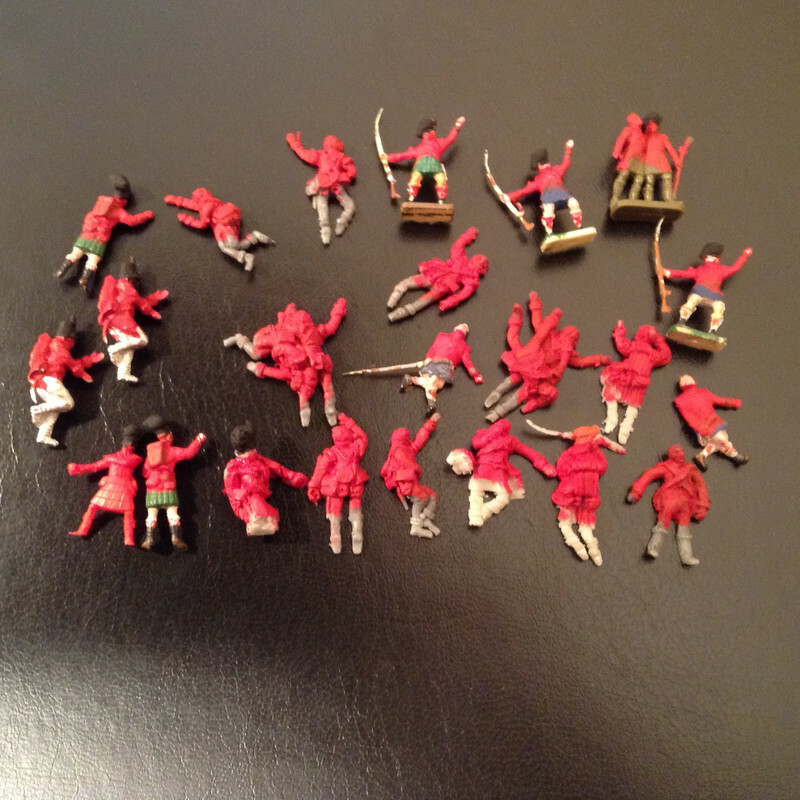 Mr Rogers unit is complete and I am off to Quatre Bras. Happy modelling and Christmas too. Napoleonic battles produced thousands of casualties a fact that a lot, but not all companies seem to choose to turn a blind eye to. A notable exception is Ykreol who seem to have an almost ghoulish fascination with death. Unfortunately their offerings come with horrendous bases and clumps of deceased in bizarre attitudes. Nevertheless, some of their offerings such as Waterloo and themed packs can offer good opportunities. These are Brunswicker's prior a major operation. Using a sharp modelling knife the bases can be removed, along with your finger, if not careful. When cleaned up, converted, we have some natural looking casualties. 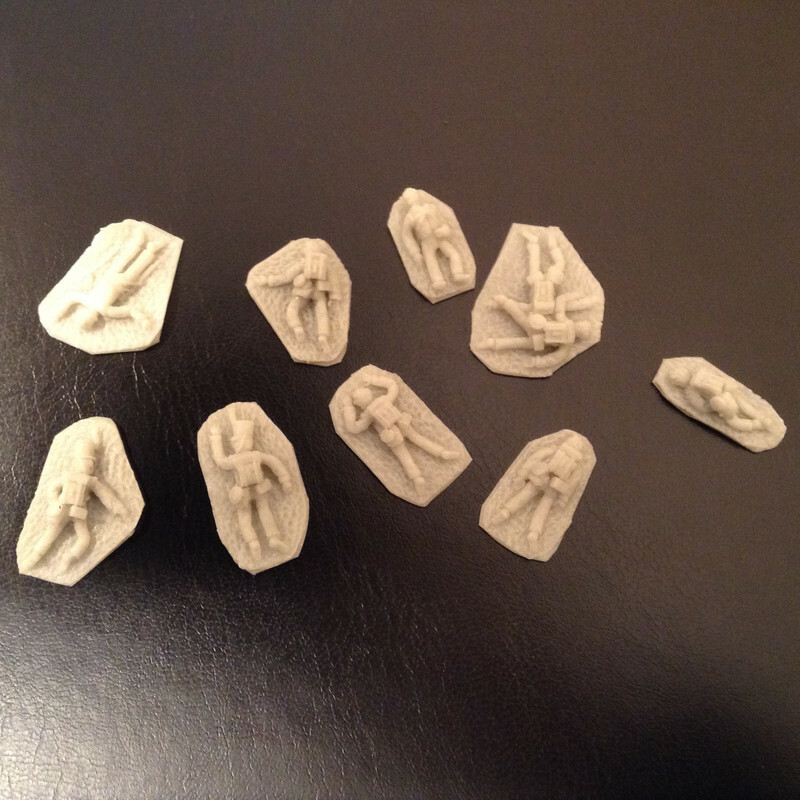 These fine fellows are from my good friend Thomas Mischak, carved up Egyptian British light infantry. Great for flank company casualties. The rest are a mixture of the usual suspects and some Ykreol Scots from their Waterloo mega treat box. 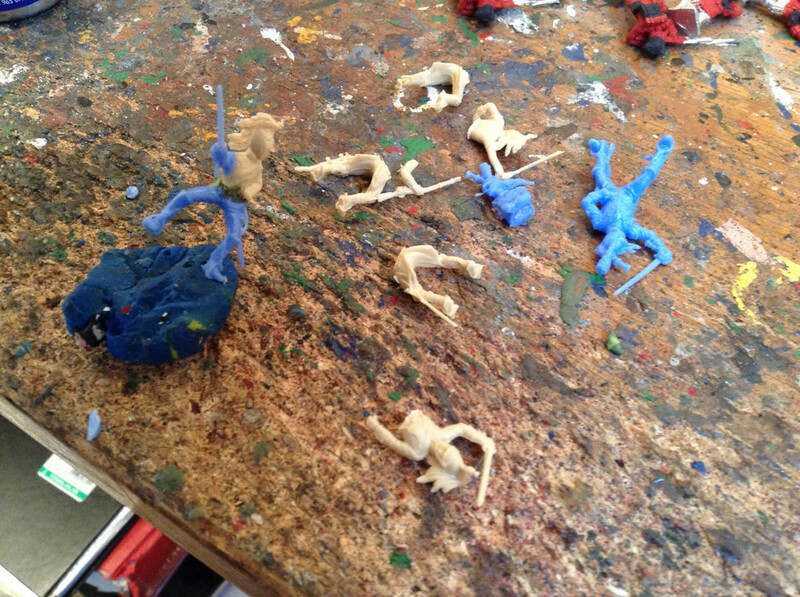 I use literally hundreds of casualties in my refights and other sources are the old Airfix boxes especially the WW1 figures. 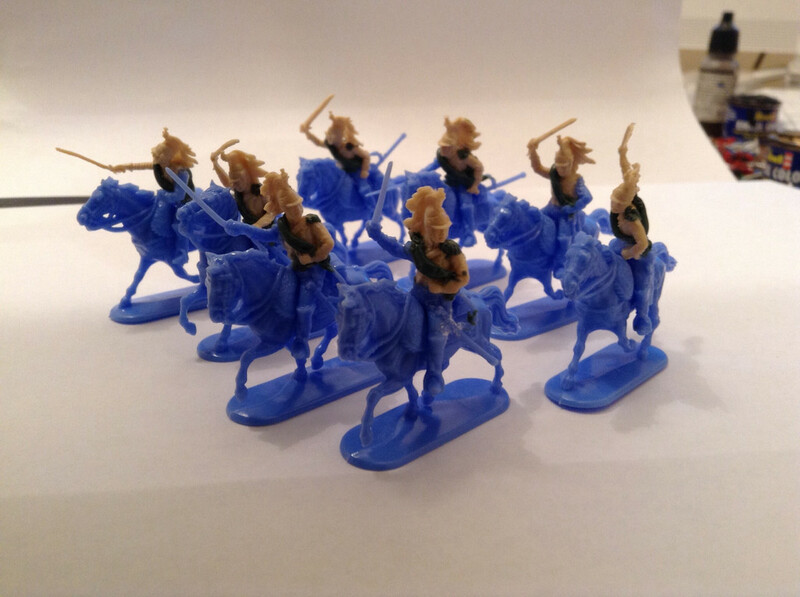 When converted there are plenty to play with, many just needing a decent pack and cartridge case, carved from a donar figure.